During the Holy Week period it is necessary to activate a special mobility, traffic, public transport and security plan to meet the needs of this time of year. Police, health and from different municipal areas make up the Plan Parihuela, which is activated in Granada throughout the Holy Week to prevent and solve incidents that may be registered in this festival, declared of International Tourist Interest. Visit Real Federación de Hermandades y Cofradías de Semana Santa de la Ciudad de Granada for more info. 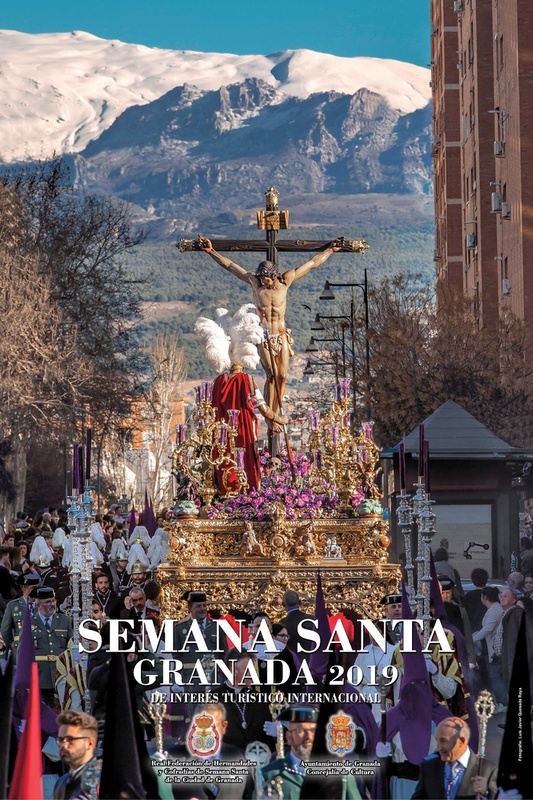 And download Program of Holy Week 2019 in Granada. This plan, with 1000 workers and more barriers, guarantees a safe, accessible, clean and solidary Holy Week. 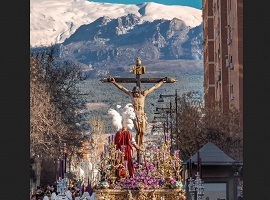 Holy Week in Granada will be this year more safe, supportive, accessible and clean thanks to the implementation by the City of Granada of the so-called Plan Parihuela 2019, that in this edition incorporates, as a novelty, a commendable joint coordination effort between institutions, companies and brotherhoods, in permanent contact throughout the year, with the aim of ensuring that the city enjoys total normality and security of one of the most spectacular weeks of Passion in Spain . The Councilor for Mobility and Citizen Protection, Tourism and Commerce in the City of Granada, Raquel Ruz, stressed that Granada will have a special security device complete and meticulous with the incorporation of a thousand effective, with one hundred percent of the staff of Local Police in service, a plan of self-protection of each of the participating temples and the establishment of more architectural barriers in points where a large number of public are concentrated to avoid possible abuses. There will be 25 anti-terrorist barriers , fifteen more than in 2018. Year after year, we are improving the security device to minimize any emergency that may occur during Holy Week , has informed, at the same time that has indicated that the security device will be activated on Domingo de Ramos and will be valid until Domingo de Resurrección. Two hospitals will be installed, one in Puerta Real and the other in Navas street. The Costalero Service Center (CEACO) will be located, as usual, on the third floor of the Plaza del Carmen consistorial building, with activity hours from 10 am to 2 pm and from 5 pm to 9 pm from Palm Sunday to Sunday of Resurrection. The Local Board of Civil Protection has held the coordination meeting in which members of the municipal areas involved, the Federation of Hermandades, Junta de Andalucía, responsible for National Police, the regional security body and Local Police and members of the fire brigade and Civil Protection have been present. Emergencies 112, Transportes Rober, Gremial del Taxi and the concessionary companies of the cleaning and water supply service, Inagra and Emasagra, complete the members of the Local Civil Protection Board meeting in the City of Granada. In this edition, Holy Week of Granada will also be cardioprotected thanks to the incorporation in each procession of a defibrillator, which, on this occasion, will have people appointed by the Hermandades that have received the corresponding training for its correct use. In total, in this first edition, more than 70 members have attended the training courses. The City of Granada wants to make the Holy Week in Granada the most accessible and social in Spain, has decided to expand, on this occasion, spaces for people with reduced mobility at different points of the Official Race (Carrera Oficial) and for the third consecutive year will make available to the social groups the municipal box located on Ángel Ganivet street. In terms of cleanliness, Holy Week this year incorporates state-of-the-art machinery that will allow you to remove the wax daily in Alhóndiga Street, a pedestrian and passing place for all the brotherhoods that carry out their penance stations in Granada, and in the busiest spaces those days. Detour scheduled around 17:00, by Local Police indications. All buses from Constitución avenue detour by Severo Ochoa, Camino de Ronda, until Plaza de las Américas where every bus line recover its itinerary. 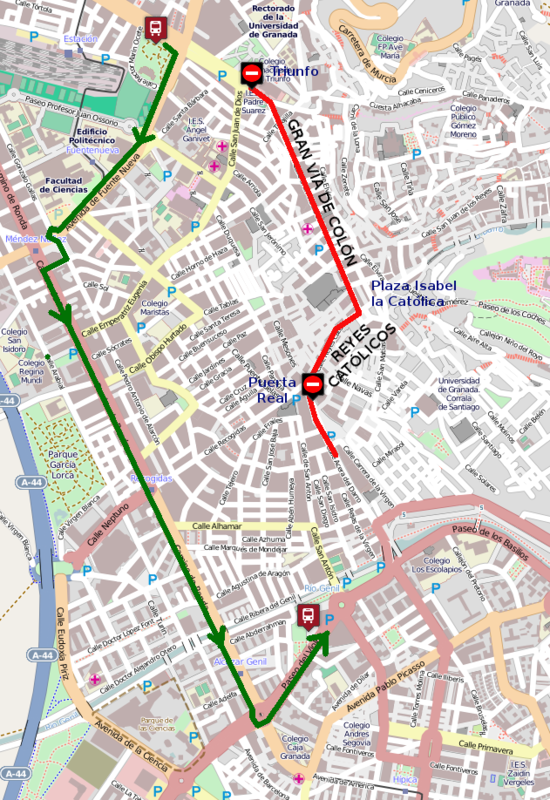 Once the cut in Gran Vía is made, bus lines that go down Cuesta del Hospicio to Constitución avenue modify their itinerary, from Cardenal Parrado they continue by Doctor Olóriz to Constitución, to make the detour indicated above. From Puerta Real detour towards Recogidas, Camino de Ronda, Severo Ochoa,Constitución where every line take its itinerary. Detour by Paseo del Violón, Camino de Ronda, Severo Ochoa towards Constitución ave.
Lines C30 and C35, when traffic cut is done in city center, works from Paseo de los Basilios by Cuesta del Caidero towards Alhambra. Lines C31 and C34, when traffic cut is made in city center will drive from Jardines del Triunfo by carretera de Murcia towards Haza Grande, with nearest stop to accessing Albaicín by Pagés street. Line C32 stops working from Sunday 14 at 15:30h until Friday 19th April. With traffic cut in Rector López Argüeta or San Juan de Dios, continues by Constitución ave towards Jardines del Triunfo. Does not go by Cartuja Campus. Whenever a cut affects you and you can not reach your usual head, it will happen at Paseo de los Basilios. While it is cut Acera del Darro, Reyes Católicos or Gran Vía deviates from Paseo del Salón to Puente Blanco, Paseo del Violón, Camino de Ronda, Severo Ochoa to Avenida de la Constitución from where it resumes its normal itinerary. While it is cut Gran Via, Reyes Católicos or Acera del Darro deviates from Avenida de la Constitución to Severo Ochoa, Camino de Ronda, Paseo del Violón to Paseo de los Basilios where it resumes its usual itinerary. They stop serving from April 15th until the 21st. From Sunday the 14th to Friday the 19th of April, they finish their service at 3:30 p.m. The Metro of Granada extends its schedule, establishing a special schedule of Holy Week, giving uninterrupted service from Wednesday to Holy Thursday and until 2 in the morning the rest of days of Holy Week, from Palm Sunday to Holy Saturday. Although there are some processions in the morning, most of them are in the afternoon and from approximately 4:00 pm there is a traffic cut in the center, mainly Reyes Católicos, Gran Vía, Realejo and Albaicín. At around 5:00 p.m. all accesses and routes that run along Gran Vía de Colón, Reyes Católicos, Acera del Darro, Recogidas and Plaza de Mariana Pineda streets and adjacent streets will remain closed to traffic due to the different parades processions, through the Official Race, runs through Mariana Pineda Square, Ganivet Angel (Official Tribune), Puerta Real de España, Recogidas, Alhóndiga, Jáudenes, Marqués de Gerona, Pasiegas Square, Holy Cathedral Church. On April 20, the general traffic cut is delayed at 6:00 p.m., while on the day of April 21, the general traffic cut will take place at 10:30 p.m.
Special attention is paid to the traffic that circulates within the perimeter constituted by: Cruz de Lagos, Palacio de Congresos, Poeta Manuel de Góngora and Puente Verde, for the purpose of making the relevant detours if the circumstances of the flow of vehicles access to the Center They make it necessary. In the following map you can see the area that is normally cut off to traffic from 5:00 pm on the occasion of the tours of the different processions, the detours of public transport along Camino de Ronda, the location of the taxi stops and the Official Race. Next we show a planning of the main traffic cuts. The cut-off time is approximate, depending on the affluence of the public and the development of the procession, as well as the weather. You can consult the information regarding transfers, via crucis and via lucis related to Holy Week 2019: Traffic cuts, routes and times of Via Crucis. Due to the passage of the processions, during the whole week there is wax on the road, being very dangerous especially for two-wheeled vehicles. Usually, traffic on San Matías and Varela streets is restricted for motorcycles and mopeds during Holy Week. At the end of Holy Week, there are traffic jams on Calle Angel Ganivet, San Matías, etc. for cleaning the wax accumulated in the road. It is usually during the entire Monday following Holy Week. The following tours may vary. Visit Real Federación de Hermandades y Cofradías de Semana Santa de la Ciudad de Granada. You should keep in mind that moving around the Albaicín and Sacromonte with a private vehicle is very complicated at this time. There will be times when the access bollards to the neighborhood are raised to restrict the passage to all vehicles , including vehicles of residents of the same. We recommend that you do not use the private vehicle. Use public transport on these dates. All the information about mobility in Holy Week can be found on this website by navigating to -> Traffic -> Conditions -> Holy Week.